Why become a CoachingOurselves certified facilitator? CoachingOurselves hosts certification events both online and in person to prepare and inform HR professionals and coaches on how to use our peer-coaching methodology in their programs and interventions. These events include information on how they should introduce CoachingOurselves’ peer-coaching to their clients, how to use our methodology to deliver programs or workshops, and how to successfully facilitate our 90-minute peer-coaching sessions. But let’s step back for a moment and look at the bigger picture. What is CoachingOurselves? It’s a 90-minute peer-coaching session using one CoachingOurselves’ module, written by a world renowned business or management leader around a specific management/leadership theme, with a group of 4-6 managers. A series of these sessions, typically one per month, are strung together to create a learning journey for a peer-coaching group. This sounds deceptively simple, but to make this effective, someone needs to take on the role of facilitator and coordinator. The coordinator role is indeed simple – someone schedules the sessions, invites everyone, and distributes the CoachingOurselves’ modules (they are in PDF format) for each session. But the facilitation role is much more nuanced and can range from simple and implicit facilitation to sophisticated and intertwined expertise. This is why our certification program is essential. The long term goal is for each group to become self-facilitated, meaning that one or more participant will take on the role of facilitator while still taking part in and benefitting from the sessions. Everyone in the group learns what to do and how to engage in the peer-coaching process, understanding how to make the content and social learning format useful for them and their organization. However, the journey from the first initial session to a fully self-facilitated and self-managed group is non-linear and varies widely. For example, it depends heavily on where they are starting, the organizational context, what they are expecting to achieve, and in many cases, the seniority or managerial level of the participants. That is a lot of variables that can only be successfully navigated by a certified CoachingOurselves facilitator and a well designed peer-coaching program. We offer two broad forms of certification: one for independent coaches and HR/OD/L&D consultants and another for internal coaches or L&D teams/HR practitioners. In each case, people being certified learn how to introduce CoachingOurselves to managers and leaders and facilitate our 90-minute peer-coaching sessions. The first question any new CoachingOurselves participant will ask is: “What is CoachingOurselves?” A CoachingOurselves practitioner better have a good answer. After that, participants greatly appreciate the presence of a facilitator to help guide them through their first few peer-coaching sessions. This is a nuanced process that should ultimately result in the facilitator putting themselves out of a job as the groups become self-facilitated. 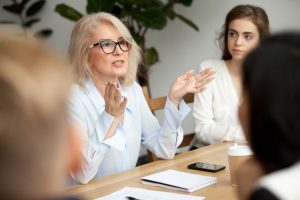 Facilitators should try to talk and intervene as little as possible to encourage this process, but also ensure sessions stay aligned with organizations’ broader goals, as well as each group’s individual needs. In addition, all certified CoachingOurselves practitioners will learn how to design a CoachingOurselves peer-coaching program or workshop. This includes learning how to select modules, determine needs, evaluate results, and kick-off and close a program. Even more in depth and specifically for our independent coaches and HR/OD/L&D consultants, we teach how to propose CoachingOurselves’ based programs to clients, price our programs, and deliver sales introduction presentations to potential clients. Most of our certifications are offered online via Zoom or GoToMeeting and only take 3 hours. After the initial certification session there are one or more 1-hour follow ups. 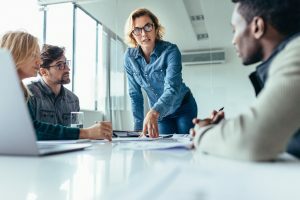 This is essential because in most cases it’s impossible to prepare our participants for all the different ways CoachingOurselves can be used for management and leadership development solutions. This is like offering a training program on the different ways to build with Legos. To address this, our certification events focus on the basic design elements of a peer-coaching program, an introduction to a popular subset of modules in our library, and an effective 1-year support process to help practitioners successfully design and deliver their their first one or two programs or interventions using CoachingOurselves. Practitioners can then follow up with us for information and advice on designing specialized programs or to ask any pertinent questions. They are also invited to join our unique CoachingOurselves partner pods, where we group our partners and practitioners into small groups and host regular zoom video calls so they can share their experiences and help one another better use CoachingOurselves to solve their clients’ problems. To learn more about the CoachingOurselves certification, contact us. We offer open enrollment certification in Quebec, en Francais, for independent coaches and OD/HR/L&D consultants through our partner Coaching de Gestion.